Want to incorporate live beat making into your set? Or how about some nice, fat buttons to bang on for cue juggles? The DC-1 is your answer. Inspired by a long line of great drum machines, the DC-1 has a layout that’s instantly familiar. All 16 of the trigger pads are backlit, allowing them to give you information as well as sending data to your chosen software. Directly above the trigger pads you’ll find an array of 8 encoders and 8 buttons, which are ideal for controlling effects or changing application parameters. And at the top of the DC-1 is a complete navigation section, with 8 backlit buttons and a fat rotary encoder. If you’re into production and beat creation, the DC-1 is a very handy tool to have – but it’s not a one-trick pony. For some things, only a nice big button with plenty of action and feedback will do. The DC-1 delivers, via its tough 1" square buttons with just the right amount of give. So whether you’re drumming samples or cue points, your fingers will thank you. Like all BEHRINGER CMD controllers, this one can run in a pack. If you’re deep into production in Live, put a MM-1 and a LC-1 next to the DC-1 for the ultimate beat creation station. 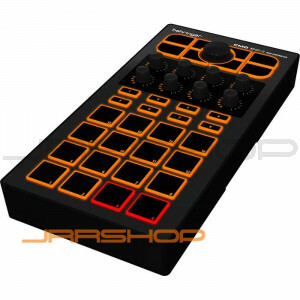 Or use it in Traktor with a PL-1 to manage cue juggles with real buttons. It’s a solid performer no matter how you use it.